Masterseal 584 Plaster Mix, Cementitious Waterproofing, 80 lb. PRODUCT: Masterseal 584 Plaster Mix (AKA Thoroseal Foundation Coat). Cementitious. GRAY Color. 80 Lb/bag. Price/Bag. 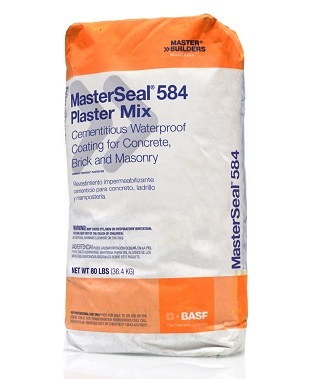 DESCRIPTION: MasterSeal 584 Plaster Mix. A cement based waterproofing for Interior and Exterior masonry, above and below grade, with a very high quality finish and excellent adhesion. Applied in two coats. Must be mixed with Acryl 60 to achieve properties listed in Data Sheet. Masterseal 584 Plaster Mix waterproofs concrete block, cast-in-place or precast concrete, brick, natural stone, Portland cement scratch and brown coats. Waterproofs all types of water retention structures including dams, reservoirs, tunnels, basements, cisterns, etc. Resists hydrostatic pressure from either the positive or negative side. Can be applied to vertical or overhead surfaces. Bonds to the surface, fills and seals pores and small voids. It specifically formulated for application by plasterer's type spray gun for troweling. Mixed with Acryl 60 and diluted with water, it produces a uniform, nonmetallic, coating of high density, compressive strength, and durability. It's coefficient of thermal expansion and contraction is nearly identical to concrete which allows it to remain completely bonded to the concrete throughout the full range of normal thermal cycling and weather conditions. Water-vapor permeable. MasterSeal 582 Foundation Coating (formerly Thoroseal FC). Waterproof Portland-cement based waterproofing coating for exterior below-grade concrete & masonry. 50 Lbs/bag. Gray Color. Price/Bag.